A lot of heart, soul and mind searching went into the decision of which bike I should take to CycleFest this year. 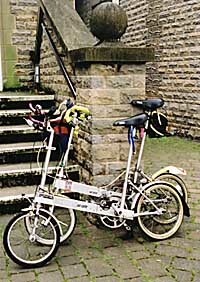 Three machines were in the running - Moulton APB, New Series Moulton and the SP Brompton. 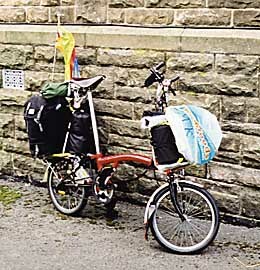 I was changing my mind every half hour or so during the day before the event, and had my things packed in small panniers to put on Packhorse carrier on the APB at one stage before final deciding on the NS. The NS is the nicest to ride, but not very train friendly, and I didn't want to have to book the bike on the train, so this would mean bagging it. That would mean removing the big rear rack, a remarkably awkward and fiddly operation. Even in the bags, a Moulton is an embarrassingly large package, or rather packages, to get on a train. One useful feature of the rather narrow Mosquito bars is that the front part of the bike goes in its bag without needing the bars to be turned. The APB with Packhorse carrier would only have needed a small rear carrier, but on the other hand would have needed the bars turning to bag it. On the road the APB is not as lively as the NS, but it still gets along well, feels very stable, has a massive range of gears and the most robust tyres of the three contenders. The SP lacks the refinement and gear range of the Moultons, but wins hands down on portability, and is a joy rather than a worry to take on a train. Because of not only the reduced physical effort but also the reduced mental stress associated with getting it on the train, the SP was probably the logical choice, but there were other factors. Moulton would be at CF exhibiting, and this is also Dr Moultons 80th year, so it seemed appropriate to reaffirm my personal enthusiasm for Moultons, which goes back over 35 years. I also thought it was about time I experienced how practical it is to bag a Moulton for a trip like this - in the past I have booked Moultons to travel on the train unfolded when carrying a load, and have only ever twice (or possibly three times?) bagged one, and then for a day trip without carriers and luggage. Using the NS and its big rear carrier made packing the luggage very straightforward - I used a standard Moulton bag, indeed the one I bought with my AM7 back in 1984. I was able to just fit everything for a week - including some publicity material and rather a lot of photographic paraphernalia - into the bag. There was not really any room to spare, but there was no need to use force to get everything in. Wednesday morning was damp, and the forecast was not particularly good, so at the last minute I put on my Polaris waterproof jacket to ride to Tipton station. Theoretically it might have been possible to catch the 06.55 train, bag the bike on the way to Wolverhampton, and then change to the express which was due to leave at 07.11, having presumably come down from Birmingham behind my local train. That seemed cutting it a bit fine though, so I caught the 06.25 from Tipton, leaving plenty of time to bag the bike at Wolverhampton. 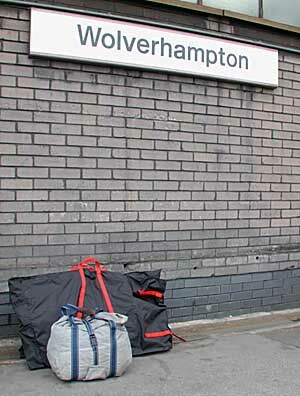 Everything went according to plan, and I started separating the bike on Wolverhampton station at 06.36 - that's the time I stopped wheeling the bike along the platform; so the time I'm about to quote is the real time to bag, including taking off the luggage. Although my test at home showed I could get the rear part in the bag without removing the pedals, I decided to take them off to make the package a bit narrower. The whole process was completed by 06.47 - that is when everything was bagged, the allen key was in my pocket and I was ready to pick up the bags - it even includes the time to take off my helmet and attach it to the rear bag. By no stretch of the imagination can you class 11 minutes as a quick fold, but I do think that the times often quoted for folding bikes are very unrealistic (with the possible exception of the Brompton) because they exclude time to detach luggage, unroll the bags, put the bike in the bag etc. I must admit that at this stage I was dismayed by just how bulky the bags looked - they seemed even bigger than when I did the test in the kitchen at home. On the other hand, the two bike bags plus luggage were lighter and easier to carry than I expected. When the Virgin West Coast express arrived, it was easy to put the two bike bags in the doorway and then take myself and the rear bag to my seat. Fortunately at this time and this stage of the journey the train was quite empty, so this could be done in quite a leisurely manner without any stress. Once we were underway, there was time to explore other storage options. The main luggage space at the end of the coach was completely empty, which is unusual. However, a Moulton bag is really a bit too long to fit in there: you would need one shelf for each bag, and they would project out into the corridor slightly, which is less than ideal. But the space behind the seats (between the sets of facing seats) is ideal - front or rear fits very comfortably in here, and you might even get both parts into the same space at a pinch. I wouldn't really want to try to use the overhead storage - heavy to lift the bike and the possible injury which might be caused if it fell off - but I guess that you might be able to put the front part there, although I doubt that the rear would fit there safely. Of course you could perform a more radical separation, which would reduce the size, but I would not want the hassle of doing this. The train journey was uneventful, and we arrived on schedule at 08.55. I got the bike off the train and re-assembled it on the platform without problems. This took 10.5 minutes - again this is the complete time, from starting to open the bike bag to being ready to push the bike to the station exit. It includes re-loading the luggage and rolling and stowing the bike bags. The good instructions provided by the organisers made it much easier to get from the station to UCSM than last time, although the one way system in Lancaster requires a circuit of the city, with plenty of traffic and inconsiderate (to put it mildly) drivers. I survived this, despite having to make an emergency stop when a large artic drove out right in front of me. Things were not due to start happening until the afternoon, but I had arrived early with the intention of having a ride round in the morning and then setting up a little exhibition of Folding Society material. What I was hoping was that I would be able to find somewhere to put my luggage while I went for a ride, rather than having to carry it with me. As I arrived at the campus, who should I see but organiser John Bradshaw arriving on a Pedersen - apparently his usual bike for travelling to and from UCSM. John reassured me that although I was early I would be able to leave my luggage in my room (I was using the on-site B&B in student accommodation), and indeed this proved to be the case. Following John's advice, I went for a ride along the new Lune Valley cycle path - a billiard-table smooth tarmac track out to near Caton. At the end of the track there was no option but to take to the main road - fortunately during the week this was not too busy, although from my experience of two years ago, it is used as a racetrack by motorcyclists at weekends. About this time there was a light shower, but not enough to be a problem, so I continued along the road to Hornby, where I turned off and climbed through Gressingham and then along the B6254 for a short while. Just as I reached the point where I planned to turn back down towards Halton, the heavens opened and I got soaked, despite taking shelter under a tree. 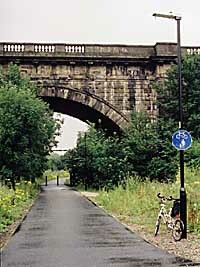 Once the rain had abated I made my way to Halton, crossed the river by a small road bridge, and rejoined the cycle path back into Lancaster and UCSM, although I had still not dried out by the time I got back. Back at Lancaster in the afternoon there was still not many signs of life - the calm before the storm, as the photographs show. I was able to put out some Folding Society material on a display board and table in the main CycleFest reception area, where it joined the official exhibits. The other exhibits included a high bicycle and a Brompton, both of which arrived by Morgan, the Brompton having the luxury of being in the front passenger seat. Around this time, the first of the early arrivals started to appear. Above: Early arrivals. 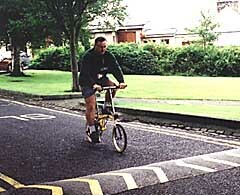 Seamus King with a well laden Moulton APB. 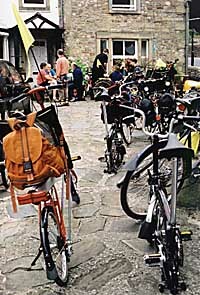 The luggage arrangements will be of particular interest to Moulton owners. The panniers at the front are the Carradice Limpets, which are particularly intended for bikes with suspension forks, and seem to work well on the APB. 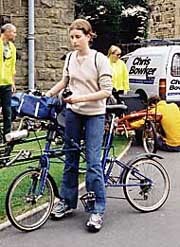 The Brompton can also carry substantial loads! 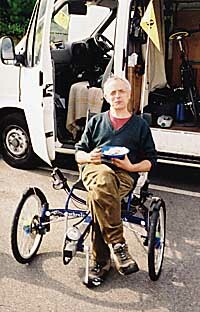 Another early arrival was Izzi Urieli, one of the evening speakers - see pictures of his portable recumbents in Folding Society news number 58. Right: The long and the short of it in recumbent terms. After the excitement of the journey and the exertions of the ride, I slept very soundly that night (as indeed I was to do every night of the event), and after breakfast on Thursday it was time for the first of the official rides. This was rather ominously billed as Abbeystead Hilly Ride, and quite a few people decided against tackling it, opting instead for flatter rides along the Lune Valley and elsewhere. Nevertheless, a good crowd was beginning to assemble for the event by now - very different from the peaceful scene the day before. 19 riders started out on the hilly ride, led by Pat Strachan on a Cresswell Rapide recumbent, although during the ride a number of others joined us. Unlike the previous day, the weather was excellent, and the roads, while quite hilly, were quiet and offered attractive countryside and good views. I had been rather concerned as to whether I would be able to keep up on this hilly ride, but in the event we rode at a comfortable pace with regular stops to regroup. The low point (metaphorically) of our ride came at the highest (physical) point, where we received the news that the cafe where we had planned to stop for lunch was closed. This resulted in a quick decision to make an exhilarating descent to Caton for an enjoyable lunch, where we saw some of those who had been out on shorter rides. 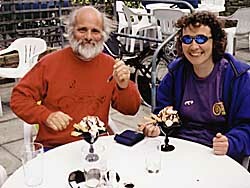 Organisers John Bradshaw and Pat Strachan on the second course at the lunch stop. From Caton we returned to Lancaster via the cycle path, stopping briefly on a bridge for a photo call. The evening brought the first of the technical talks, Ben Cuthbert on Hydraulic Bike Drives. His proposed system, using peristaltic pumps, was greeted with some skepticism by most of the audience. Izzi Urieli then gave a talk about his recumbents, illustrated in Folding Society News number 58, and the belt drives and split hubs which they used. The split hubs were remarkable in that once the wheel is assembled, there is no glue or mechanical mechanism keeping the two parts aligned, and yet they stay in alignment, as Izzi demonstrated . There was also a bonus that evening in the form of a film of a competitive event for human powered boats. After some socialising, it was time for bed and another good night's sleep ready for the following days events. What better way could there be to have breakfast? Derek Carpenter puts his Anthratech to good use. Two rides were available on Friday - a family ride and a longer ride to High Bentham. 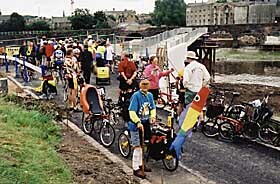 Both featured a visit to the new cycle bridge first, and it had been hoped that this would coincide with the opening of the bridge. However, as our picture shows, the bridge is still only half complete. The turn out for the longer ride was substantial (around 50 people), and to make it more manageable, we split into two groups, the first comprising those who wanted to go faster, into which group I rather doubtfully put myself. Once again we rode along the Lune Valley Cycle Path to Caton, and then along the main road before turning off towards High Bentham. We experienced a few light showers during the ride - irritating more than anything else, since as soon as you stopped and put on a waterproof, the rain stopped again. We rode quite quickly to High Bentham, but fortunately as I was on the NS I had no difficulty keeping up. The two groups both lunched at High Bentham, and continued together after the lunch stop. Until then we had not encountered any significant hills, but immediately after the stop we were confronted by a long steep climb to the Great Stone of Fourstones, where we gratefully stopped for photographs. To my consternation one of the lenses fell out of my glasses at this stage, the fixing screw having come adrift. Mercifully no damage was done to the lens, and the screw was still in place, and I was able, to replace it, although with considerable difficulty. 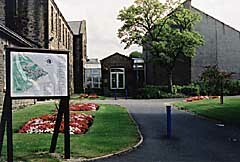 From there is was downhill and then back to Caton and the cycle path to Lancaster. Conditions had turned much cooler after lunch, and we were riding into a noticeable head wind on the way back. 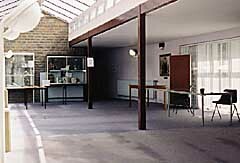 By the time we got back to Lancaster in the mid afternoon, the Trade Show was open, although some exhibitors had not yet arrived, and most of the others were still in the process of setting up. The Trade Show ran from the Friday afternoon through to Sunday afternoon. As Pashley and Moulton had not yet arrived, I put my NS in a prominent position just outside the door in to the show. The Friday evening talks were by Theo Schmidt (Swiss Electric Bikes - a progress report), Ross Lowell (a superb film entitled "Wind in my soul") and Tony Hadland (A century of Tin Cans - evolution of the hub gear), all informative and entertaining. Of most immediate interest to me was the Airnimal Chameleon. I had tried a prototype, then called, more simply, the Animal, at CycleFest two years ago, but the bike is only just going into production now. One of our members, Simon Davies, is buying one, and his first impressions appear in Folding Society news number 58. I had a short ride on one of the three test bikes that Richard Loke had brought, but this is not such a thorough test as Simon's, so I suggest you read his report for more details. 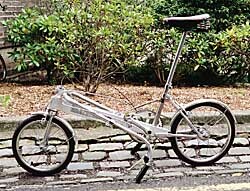 The bike uses 24 inch wheels and has an aluminium frame. The bike I rode had a very long stem, quite wide dropped bars, and narrow tyres - not an ideal configuration for me, but probably indicative of how the bike will mainly be used. It seems to be very much in the Bike Friday Pocket Rocket, or Air Friday, sector - a light, fast, road bike. 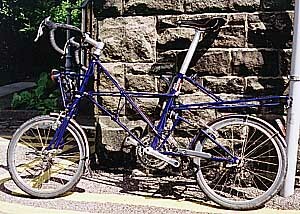 There is rear suspension, but no suspension on the front - the bike I used had carbon fibre front forks. 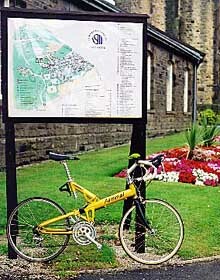 It certainly felt quite fast, although riding round the campus did not give a proper opportunity to evaluate it. The ride from the unsuspended forks felt quite harsh - but it should be remembered that I had been riding the NS Moulton, so almost anything would feel harsh after that. 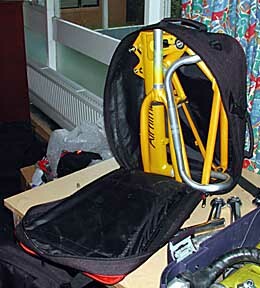 A suitcase is available into which the complete bike can be packed - for example for air travel - and this looked to be rather smaller than the equivalent Bike Friday case. 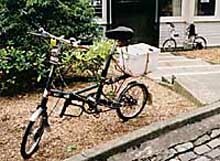 However, there does not yet appear to be a trailer option for towing the case when the bike is unfolded. 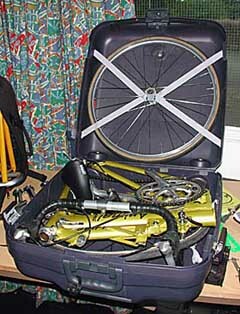 There was also one bike partially packed into a soft case - apparently this might make it possible to transport the bike as cabin luggage by air, though I'm not sure quite what one would do with the wheels. There is no doubt that the Airnimal is going to appeal to some people with its aluminium frame, rear suspension, larger wheels and sporty characteristics. Personally, though, I would at present (and bear in mind I haven't really given the Airnimal much of a test) tend prefer a Bike Friday Pocket Rocket if I were looking for a bike in this category - I prefer a steel frame (no significant weight penalty), folding etc at least as good, and I'm not too sure about the tyres available in the 24 inch size, and the luggage carrying capabilities. I await with interest more reports from Simon Davies before making any judgment. Both Pashley and Alex Moulton Bicycles were exhibiting at the Trade Show, with a variety of APBs, two New Series Moultons and a Jubilee L, which looked particularly smart in dark grey with front and rear carriers and black bags. 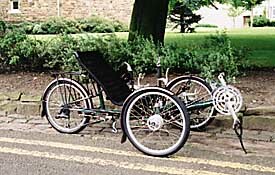 Pashley also had a 2-wheel PDQ recumbent, but not the tricycle version. The range of separable APBs now includes the dropped handlebar, all-derailleur, J16 and the APB 3 x 7 (similar to the Land Rover, but with more sensible tyres) as well as the T21 and S7; the fixed-frame range consists of the fx8, the special Millennium Edition and the automatic-geared fx4. 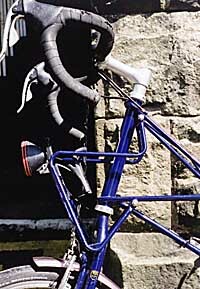 It was distressing to note that two of the APB demonstrators had squeaking front suspension - it sounded like the coil spring rubbing inside the head tube; this happened on the prototype fx8 which I tested back in September 1999 - I mentioned it to Pashley at the time, but didn't actually refer to it in the report as I assumed it was a minor problem on this particular example. Hidden a little way from the bikes on show was Dan Farrell's own APB, complete with the new front carrier, which, rather like the Lund packhorse, can be used to carry two small panniers. There were a number of other interesting features of Dan's bike - note the rear carrier and frame joint, for example. 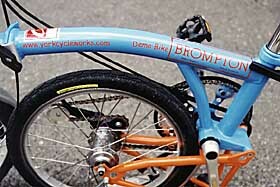 York Cycleworks had this rather spectactularly coloured Brompton demonstrator at the event. Steve Parry was not exhibiting in the Trade Show, but had a couple of his modified Bromptons which attracted quite a lot of attention. Steve now seems to favour the version with the hinge removed, the idea being that the long thin package which results can make use of overhead storage space on trains. Most people I have spoken to much prefer the version which retains the hinge and makes folding into a shorter package easier; Steve will still supply these, even though both the demonstrators he had brought were the non-folding variety. The two-speed is certainly very nippy over short distances, but it's expensive for such a machine, and I think most prospective buyers will be more attracted by the 12-speed version with the hinge, similar to Chris Dent's machine. Photograph: Graham McDermott takes a test ride on one of SPs. Peter King was suffering a leg injury, and so was not riding much. However, he was tempted to try one of the Trices. Jean Seay of the IHPVA and Derek Carpenter discuss the relative merits of the Anthrotech and Greenspeed. Jean's Greenspeed is special model using 16 inch wheels (Primo tyres), especially intended for shorter riders. Not everyone could get to grips with the remarkable Mic Wic tandem, but Jon and Anne Coulson appeared to enjoy themselves with it. Although there was quite a strong folder presence at CycleFest, the event is probably more orientated towards recumbents - at least this year. 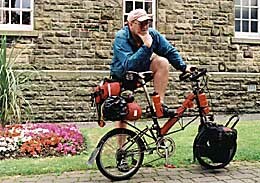 A problem with most recumbents, and especially tricycles, is that they are not very portable. 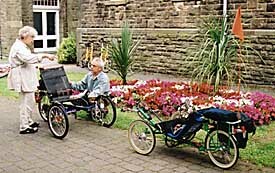 A kit to make the Brompton into a recumbent is available, and of course Green Gear have produced a recumbent Bike Friday, the SatRDay, although there were none of these at Cyclefest. 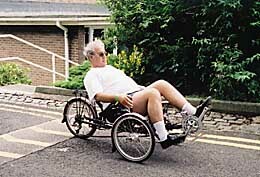 Some of the trikes can be disassembled to some degree to improve portability, but this is not especially quick and easy. Izzi Urieli demonstrated a recumbent that can pack into a relatively compact bag, but it takes quite a long time to assemble and disassemble. 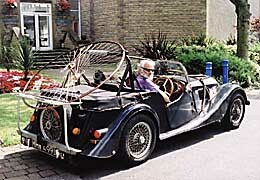 For pictures of Izzi's machine, see Folding Society news number 58. 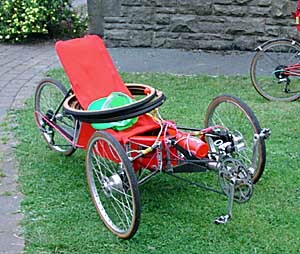 Left: The Gnat (Great Nick Andrews Trike) is apparently a prototype of a more portable recumbent tricycle. 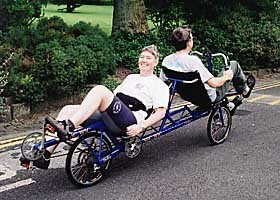 The idea of a recumbent has its attractions for me, but riding with experienced recumbent users at CycleFest it was evident that balancing can be a problem when travelling slowly and they don't climb hills very well, as well as the portability problem. I wouldn't be happy with the balancing problems, and much as I would like a trike for fun, there are so many situations where it would not be usable, or I would have to go via a different route just because of its bulk, that I think I shall be able to resist the temptation. Of the trikes I have seen, the Anthrotech, Windcheetah, Greenspeed and Trice seem the most attractive; the Trice in particular seems very nicely engineered, and is available in a narrow version with rear suspension. One of the Trice Explorer demonstrators at CycleFest - certainly fun to ride, but like other tricycles, and recumbents in general, not very portable and not very practical for my purposes in other respects as well, unfortunately. Above: Moultons are a common sight at CycleFest, and, as always, you never see two the same - they have all been customised to suit their owners. Above: It was good to see some Bickertons at the event - both much modified and relatively standard. The trick of using the handlebars as a stand is rarely used by owners, even though it is described in the manual. 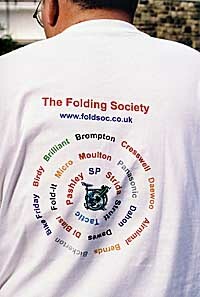 Graham McDermott models a Folding Society T shirt. Saturday and Sunday had more emphasis on events rather than riding, with the Trade Show on both days, and Sprints, Fun Races, the Festival of Light and Water, a Torchlight Parade and Kite Flying at Morecambe and the BHPC races at Salt Ayre on Sunday. Morecambe on a Stauday in August did not hold any great appeal for me (I'm very unsociable and don't much like large crowds), so after spending some time at the Trade Show I went for a ride on Saturday afternoon to Garstang and back via Pilling. Most people went to the Festival of Light and Water at Morecambe on Saturday evening, which I understand was very successful, although a few others were discouraged by the damp weather and stayed at UCSM like myself. Sunday morning I spent at the trade Show again, before riding with Chris Dent and Steve Parry to Glasson Dock, where we had a light meal, lent a puncture repair outfit to a leisure cyclist who was in difficulties, and then returned to Lancaster for the evening. Evening entertainment came in the form of a slide show by Steve Holard on his end to end journey using a PDQ recumbent bicycle on the road and water (canal), entitled "Pedal to Paddle - End to End", and live music in the bar and outside. 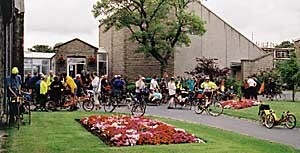 Arrangements for a ride on Monday were a bit uncertain at this stage, and Michelle Whitworth and Derek Carpenter (Bike Fridays) suggested we might take a train to the Lake District, have a ride there, and return by train and bike. This certainly sounded very attractive to me, apart from the lack of poratability of the NS as far as train travel was concerned, but in the end not many other people seemed to want to do this ride, and as the weather on Monday looked a little dull, the idea was abandoned. Perhaps next time we could put such a ride for folders into the programme. The ride on Monday was over quite flat country towards Pilling, and covered much of the same ground as my Saturday afternoon ride. 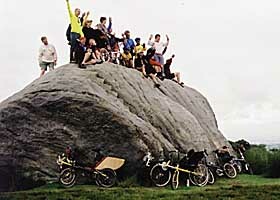 Left: Riders pause briefly on the Monday ride after climbing one of the few slopes. 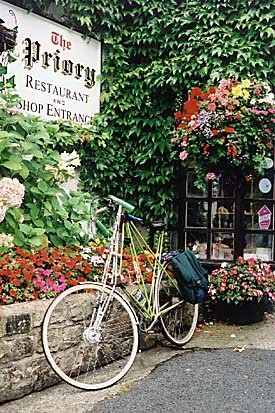 The lunch stop on Monday. Graham McDermott took a fancy to the idea of owning a Pedersen during the evnt, and was last seen planning a trip to Copenhagen to order and take delivery of the one! Left: This Pedersen was pictured at the lunch stop on Monday. Tuesday dawned rather dull; I had intended to travel home on a train leaving at 13.40, but in view of the weather, I decided to catch an earlier one. Bagging the NS at Lancaster was rather a pain, but I must have been getting better with practice, as it only took 8 minutes this time. Unfortunately, this train was rather full, and I ended up standing in the lobby with the bagged NS all the way back to Wolverhampton. At least the bagging not only saved me the cost of taking the bike as luggage, but also gave me the freedom to choose which train to travel back on. Incidentally, I noted that the train was so full that most of the overhead storage space was occupied, and a long package, such as the non-hinged SP-Brompton would not have fitted there, reinforcing my view that the normally hinged Brompton is the most practical folder for train travel. 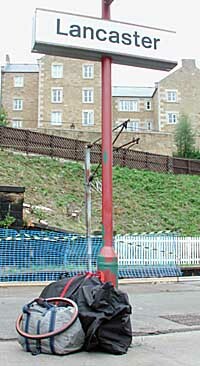 Right: The NS in its bags ready to board the train at Lancaster. Unfortunately the train arrived at the most distant platform at Wolverhampton, so I carried the NS in its bags to the local bay where my last train was due to depart. I forgot to time the process of reassembling the bike this time. Left: The NS, still in its bags, back at Wolverhampton, before re-assembling it on the platform and the local train on the last leg of the journey home. 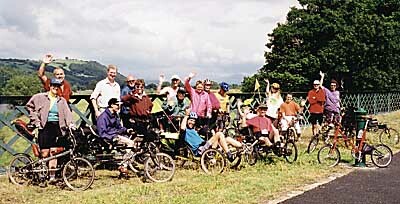 CycleFest is the alternative cycling event, with a focus on 'unconventional' cycles such as recumbents, Moultons, Pedersens and folders. What surprised me this time was that there were quite a lot of people riding conventional diamond framed machines. There was a very good turn out of folders - in fact I think that there were more there than was sometimes apparent, as a lot of people had brought a folder along as well as something else, but did not use it all the time. 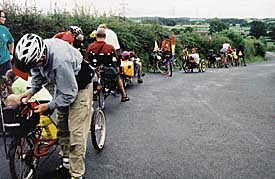 The majority of people travelled to the event by motor vehicle; some may wish to criticise this, but it's worth remembering that those wishing to bring more than one cycle, or bringing a recumbent, cannot easily do so by train, and the event is definitely one where it would be nice to have a choice. In addition, most of the motor vehicles were carrying families, or at least two people, so neither they nor the event should be criticised on environmental grounds! My own choice of the NS Moulton for this event proved to be successful - it was a bit of a pain to bag it for taking on the train, but not too bad for an event which lasted a week, and the bagged bike fitted easily between the seats on the train - at least on the way up. With the large rear carrier and bag there was ample luggage capacity for a week. Once at Lancaster, the NS provided a superb ride, with just two minor problems. I had was when the rear triangle pivot bolt worked loose on the first day, a result, I suspect, of the train journey; I find a train journey always seems to loosen bolts which were not done up quite tight enough. I also found that the cable outers to the rear, which I had replaced when changing the wishbone arms a few months ago, were being caught and damaged on some of the Flexitor suspension mounting screws - probably as a result of the fact that I had used slightly longer cables than the originals. As in the past, CycleFest combines a very well organised and planned event - Trade Show, talks and films, organised rides - with a very informal and relaxed atmosphere. My only regret is that I did not discover CycleFest until the last event two years ago, and I missed all the earlier ones. I think everyone would want this report to end with our thanks to all those involved in organising this very successful event - we are all eagerly looking forward to the next one! 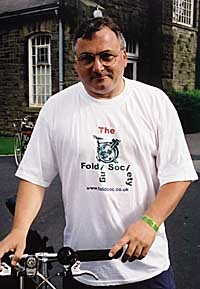 In the next issue of Folding Society News (Number 59) I will probably offer a few final thoughts on CycleFest 2000.